I created this lamb dish just to have something to eat with chef Duskie Estes's sublime pickled cherries that I now try to make every spring. I created this lamb dish just to have something to eat with chef Duskie Estes's sublime pickled cherries that I now try to make every spring. I was one of the judges the year she won the Cochon 555 in Colorado at the Food & Wine Classic in Aspen. Her pickled cherries were so impressive that I sought her out afterward to introduce myself. Yup, I chef-stalked her for the recipe! She and I have become friends over the years and she is one of the most accomplished and kindest people in the business. 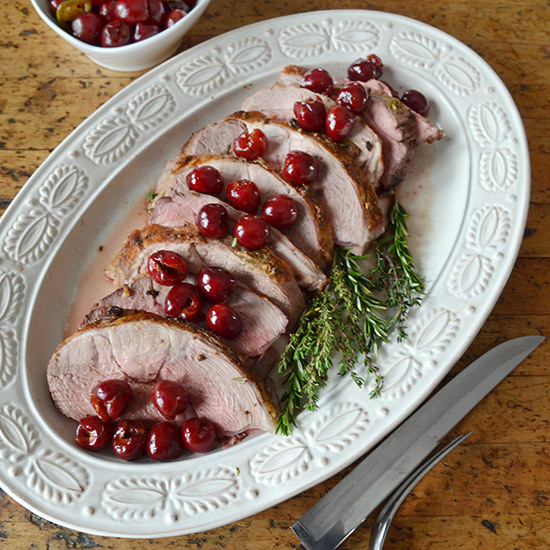 Anyway, lamb is perfect set against the tartness of cherries. There is no better time of year than now to be eating young lamb legs. A word on cooking them: About 10 years ago, I watched Jamie Oliver do a demo where he used his oven rack to cook his lamb. No pan at all. Instead, he used a big pan on the rack below the lamb to catch the drippings—a pan you can fill with potatoes, whole peeled shallots, leeks, carrots and parsnips. Its one of those simple "why didn't I think of that" ideas that is ideal for lamb, allowing home cooks to get lamb legs crispy and roasted all the way around. I use small young lamb hindquarters with the aitch bone removed and cook them to medium-rare. I pull them from the oven and let them rest for a good 20 minutes, then slice and serve.